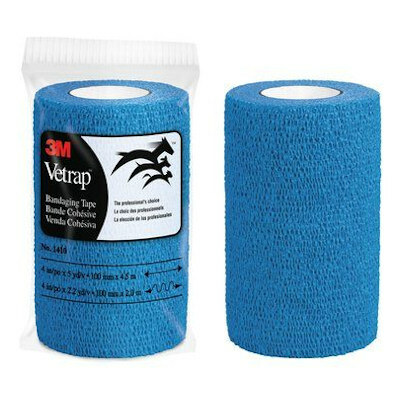 Vetrap* or CoFlex* 4 inch X 5 yard per roll bandaging tape self-adherent wraps, available in 3 colors, Red, White or Blue. *We reserve the right to ship either brand depending on our stock--SELECT COLOR Below That You Want To Order. Vetrap is the same as CoFlex, both are top of the line wraps preferred by most professional horse trainers and veterinarians. Both Vetrap and CoFlex contains natural rubber latex and it has layers that bond together to provide superior support and holding power, will not slip. Raps should be removed and reapplied daily, it should not be applied directly over open wounds.